I don’t have a sweet tooth, but after receiving a copy of “Sweet” by Yotam Ottolenghi and Helen Goh for Christmas, I added post it notes to 3/4 of the pages with great anticipation, dreaming of delicious desserts, cakes, cookies and preserves. I have to confess at this point that I have had mixed results making Ottolenghi recipes. Before you jump to his defence, I must say I love his philosophy, his ideas and enthusiasm, but I’ve been disappointed by many recipes that I’ve made from his books, so disappointed that I now rarely take them off my bookshelf. The recipes in “Sweet” which Ottolenghi co-authored with Aussie chef Helen Goh are unchartered territory for me, so finally, at a whim, I tested my first choice, Soft Date and Oat Bars. The preamble to the recipes likens these oat laden bars to British flapjacks, a sweet and chewy coffee shop staple which I developed quite a taste for we last visited the UK, but these are much much better than that. 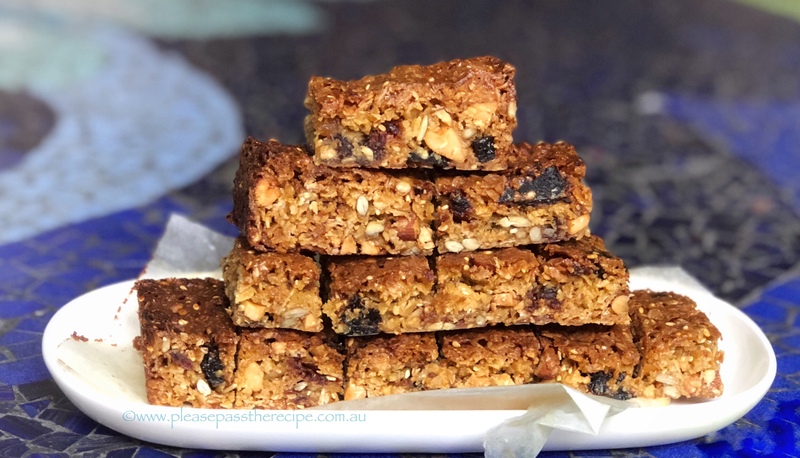 Yes there are oats like a flapjack, but this recipe also has seeds and nuts and fruit, sending it in the direction of a commercial packaged muesli bar, but again, much much better. It may seem to be a waste of time roasting the nuts and toasting the seeds when they are going into the oven mixed into the batter, but I believe it’s the crunchy textural element and toasty depth of flavour that makes all the difference here, so don’t be tempted to eliminate that step. The remainder of the recipe is fairly straightforward, melt and mix. I made a few modifications to the recipe to avoid having to make a dash to the shops, but judging by the speed this first batch of bars disappeared, it’s a recipe worth making again and again. My kitchen is around 26C most of the time so the bars were quite soft stored at room temperature. We preferred their firm but chewy texture straight from the fridge. Preheat the oven to 170C fan forced. Oil a slab tin, 26cm X 20cm and line with baking paper. Put the almonds and cashews in a baking tray in a single layer. Roast for 10 minutes or until lightly golden. Allow to cool a little then roughly chop into chunks. Place the seeds in a dry frying pan and tossing the pan frequently, toast the seeds until golden. Process 80g of the oats so they are chopped very small but not powdery. In a large bowl combine the whole oats, chopped oats, nuts, seeds and chopped dates, cinnamon and salt. Mix well to combine. Use you fingers to break up any clumps of dates. Put the butter, sugar and golden syrup in a small pan and stir over a medium heat until the butter is melted. Remove from the heat, add the lemon juice then pour the mixture over the dry ingredients. Press the mixture evenly into the slab tin with the back of a spoon. Bake for 35 minutes until bubbling and golden brown, about 35 minutes. Remove from the oven and allow to cool in the tin for 30 minutes before cutting into bars. I have just made these bars and I think they will be delicious. However, I too think there is too much butter and I also halved the sugar. I have individually wrapped them as they were so crumbly. I think packing them down in the tin before cooking would improve their ability to hold together. Have you ever made these bars before Glenys? It’s hard to judge the impact of essential ingredients on a recipe without baking a test first. The crumbly texture you complain about is a direct result of your reduction of the butter and sugar. They caramelize as the bars bake and to create a delicious chewy texture. Just wondering if i can reduce the amount of butter used to about half. Pl let me know if it would work . Hi Sharmila, I don’t know the answer to that. The only way to find out is for you to trial it but I suspect that they would be very crumbly. These bars sound so healthy you could really live off them. I’ve been following the discussion re Ottolenghi. I’ve had a few successes with his cakes, but I find his savoury dishes tend to mix too many things into what could be a simpler recipe. I don’t like his use of maple syrup in savoury things for example- it seems to lack authenticity- and some of his combos are totally weird- such as mixing soba noodles with mango. I’m hoping you discover more gems in this book Sandra. Thanks for that explanation Sandra re sweet savoury and acid. Now I’ll be checking Ottolenghi in a new light. Cutting the sugar hit with lemon is a great idea. Who doesn’t like a good flapjack? I’ve had the same experience with Ottolenghi – hit or miss recipes. I love the food philosophy, too. These are much more than the average flapjack and worth trying. I need to catch up on my reading, I think I’m a few posts behind…. Right, this gets saved for when I get back home, late April. Hope you enjoy these bars as much as we have…. So sad when cookbooks don’t live up to expectations, but pleased to hear that you’ve had success with with ‘Sweet’ so far. I’ve been eyeing off this one lately in the bookshops, but for some reason keep hesitating… so many cookbooks on the shelf already. Love this mix of seeds, nuts and dates – yum! Beautiful books. But I have had extremely mixed results with Ottolenghi recipes also. I’ve heard the same complaint about Ottolenghi’s books. Unless it was you! I don’t enjoy sweets, either, as much as savory, but I think that’s really funny that you’ve bookmarked over half of the cookbook! These bars sound good. Realistically Mimi, I’ll probably only make one or two recipes but is some great inspiration in “Sweet.” These are delicious. Good to know! The problem with me, is if there is something sweet around, I remember it at about 9 PM… and can’t stop gorging! Sad. Right then, sesame seeds on the shopping list for Saturday. Thank you! This entry was posted on March 29, 2018 by ladyredspecs in Baking, Cookies, sweet biscuits, Cooking, FODMAP diet, Food, recipes, Slices and Tray Bakes and tagged cookies, date and oat bars, dates, FODMAP diet, low FODMAPS, oats, Ottolenghi, tray bake.